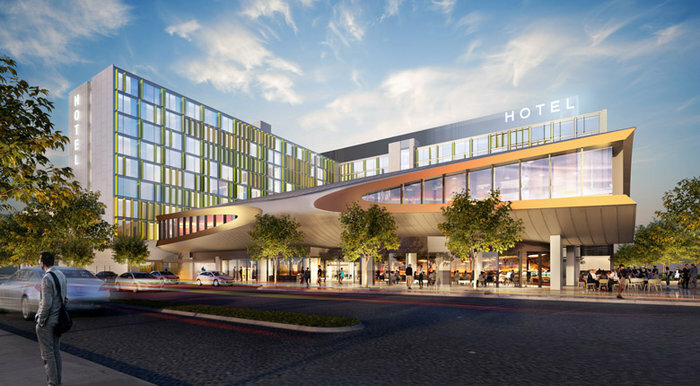 Australia’s Melbourne Airport is to join forces with AccorHotels to build a dual-branded, 464-room hotel in its new property precinct, The Hive. The hotel will operate under the Novotel and Ibis Styles brands, and will be just steps away from Terminal 4. Amenities will include a wellness center, conference rooms, pool, gym, café, bar and combined restaurant facilities. It is hoped the expansion will support the airport’s growth in passenger numbers and customer satisfaction. Linc Horton, chief of property at Melbourne Airport, said, “Demand for air travel in and out of Melbourne is at an all-time high. It’s going to continue to grow strongly so we are thrilled to welcome AccorHotels to Melbourne Airport, helping support our forecast passenger figures of almost 70 million travellers by 2038. Melbourne-based architects Fender Katsalidis will take on the project. The company’s director, James Pearce, added, “The hotel is going to act like a village center and a gathering place to support the airport community in addition to travellers. “The 10-story hotel features wings that not only catch the eye, but also provide product efficiency. The façade also has sunshades that create an interesting abstract landscape in Pop Art colors. Construction is to begin in the second half of 2018.